England kept their World Cup campaign alive with a dramatic 18-run win over the West Indies in Chennai. Jonathan Trott (47) gave England a fast start but wickets tumbled in the middle overs and they were dismissed for 243. The win means England are through to the quarter-finals unless Bangladesh beat South Africa and the West Indies get at least a point against India. For the sixth match in succession, England were involved in a rollercoaster of a contest, which swung back and forth right through to the end. Having reduced the Windies to 150-6, they were favourites to win the match, only for Ramnaresh Sarwan and Andre Russell to seemingly take the game away from them in a partnership of 72. But after Russell fell leg before wicket for 49 to give man-of-the-match James Tredwell his fourth wicket, the Caribbean side crumbled in calamitous fashion. 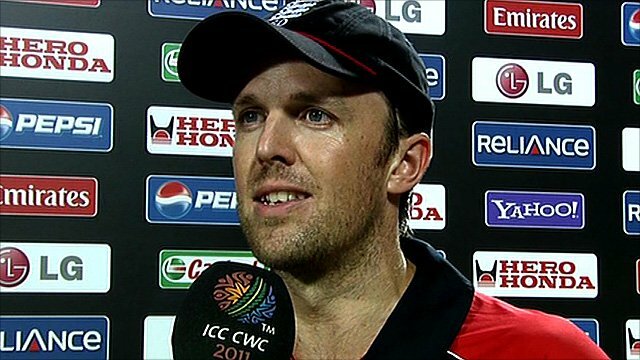 Two overs later, Graeme Swann (3-36) had Sarwan caught at short leg by Ian Bell and Kemar Roach holed out to Chris Tremlett in the deep. A breathless passage of play was complete when the Windies' final pair attempted a risky second run and Sulieman Benn was run out after a fine throw from Trott to spark riotous celebrations in the England camp. Captain Andrew Strauss and his men now face a nervous weekend, with Bangladesh facing the Proteas in Dhaka on Saturday and the Windies rounding off the group stage against India in Chennai. But assuming at least one of those games goes the way of India or South Africa, England will be two victories away from the World Cup final. Summarising on BBC Radio's Test Match Special, former England captain Michael Vaughan said Strauss's side should not be ruled out in an open tournament lacking a truly outstanding team. "You wouldn't think England are playing well enough at the moment to win the World Cup, and they haven't yet produced an all-round performance - but they've proved that in these tight games, all you need is to score one more than the opposition," he said. England's batting performance was a patchy affair, featuring an uncharacteristically aggressive knock from Trott, a middle order collapse, and a handy cameo from Luke Wright. The Sussex all-rounder was handed his first appearance of the tournament along with Tredwell and Tremlett as James Anderson and Paul Collingwood were dropped and Ajmal Shahzad was ruled out through injury. England made a steady start on a wicket that appeared much truer than the one that staged their low-scoring victory over South Africa. Matt Prior looked to be settling in for a decent score when he was beaten for pace by Russell and bowled off a faint inside-edge for 21. Trott, perhaps stung by criticism of his cautious approach, batted like a man possessed. He clipped his first ball off his legs for four and struck three more boundaries off a single Russell over to help England accelerate to 73-1 after 11 overs. Strauss soon found his range with a six over square leg off Sammy but when tempted into another swipe by a Russell bouncer, he got a top-edge on the ball and was well caught by Chris Gayle running round from midwicket. Trott's demise came out of the blue as he attempted to steer rookie leg-spinner Devendra Bishoo through the leg-side but glanced a simple catch to Gayle. Ian Bell's innings was a familiar tale of slow scoring and frustration as shot after shot failed to penetrate the infield. 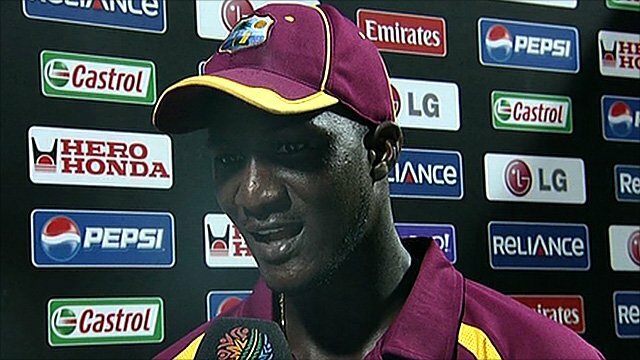 Having laboured to 27 off 48 balls, with only a single boundary, he was clean bowled by Kemar Roach. Eoin Morgan was the next to go as a poorly executed reverse sweep brushed his bat on the way through to wicketkeeper Devon Thomas, before Ravi Bopara was bowled by Russell off an inside edge. Wright and Tredwell added 41 for the seventh wicket before a running mix-up cost the Kent man his wicket. Wright gave England the lift they needed with a measured 44 off 57 balls, but a momentary head rush cost him dearly as he was caught on the boundary trying to heave Bishoo for six. Swann was bowled by Russell for eight and Tremlett was caught behind off a Roach bouncer to end the innings eight balls short of the full 50 overs. As ever, the Windies looked to Gayle to kick-start their innings and the tall left-hander did not disappoint, as he smashed 36 runs off two overs from Tim Bresnan and Tremlett to catapult his team to 50-0 off five overs. 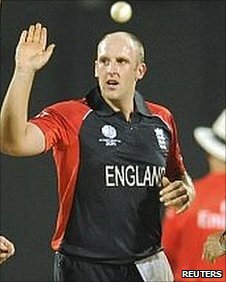 The onslaught prompted a rethink from Strauss, who threw the ball to off-spinner Tredwell to join Swann in the attack. The plan came off as Tredwell trapped Gayle in front of his stumps with his fifth ball. Tredwell picked up the wicket of Smith in his next over but Windies skipper Darren Sammy, promoted to number three, picked up where Gayle left off to fire them to 78-2 after 10 overs. The score had moved on to 91-2 in the 13th over when Tredwell struck another blow as a beautifully flighted delivery clipped the edge of Darren Bravo's bat and was snaffled low down by Strauss at slip. Sammy brought up the hundred with his third six over long-on but his innings came to an end with the first ball after the drinks break as he chopped a regulation delivery from Bopara on to his stumps. Devon Thomas fell in similar fashion to bring dangerman Kieron Pollard to the crease. After a watchful start, the stocky Trinidadian smashed Bresnan over mid-on for four and Swann for six over midwicket. But just when he was looking dangerous, Swann fizzed through a quicker delivery that accounted for Pollard lbw for 24. With the Windies' long and inexperienced tail exposed, England looked odds-on for victory but Russell's fearless hitting and Sarwan's cool head turned things around. However, Tredwell and Swann ensured there was one final twist in England's latest drama.